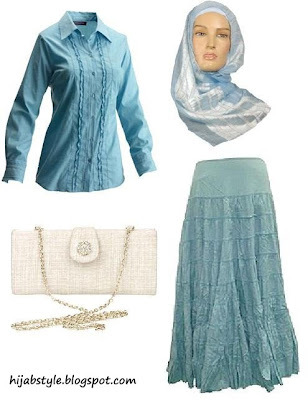 Ruffle shirt £25; La Redoute, blue hijab £5.99; Muslim Base, blue skirt £9.95; Uttam Direct, jacquard clasp clutch £20; Accessorize. Melissa looks pretty but your take is gorgeous. Go hijab, go hijab! Salam Hayah! Loving the look! Thank you for your sweet comments, INSHALLAH we are planning on adding more items. We found very amazing Islamic designers that are working with us. I have added your link to my blogroll, keep up your lovely work.